Update: And just like that, the game is back up on the Wii U eShop. We'll let you ponder why this might be in the comments section below. Original Story: The Nintendo Switch has had its fair share of Wii U ports, something which has divided the fanbase a little, but makes a whole lot of business sense. Considering the poor sales of the Wii U, many games that saw an exclusive launch on the console didn’t get a proper chance to reach a wide audience, and porting these games over to the Switch gives them a new lease on life while also filling in gaps in the Switch’s release schedule. 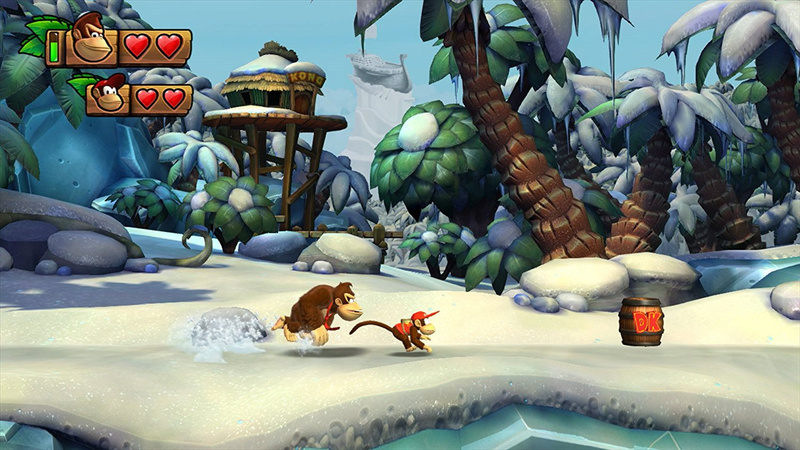 Donkey Kong Country: Tropical Freeze is the latest game to be receiving the porting treatment—it launches next week—but Nintendo has made a questionable move regarding its original release. Strangely enough, Donkey Kong Country: Tropical Freeze can no longer be purchased from the North American Wii U eShop, not even via download code from Amazon, although other regions still have access. It very well could be just a bizarre mistake made ahead of the launch of the Switch version, but some are suspecting foul play, and it doesn’t seem unreasonable. Until its disappearance, the game could be bought on the Wii U eShop for twenty bucks, significantly less than the full price version launching next week. Considering that the new version has minimal changes from the Wii U version, some are saying that this could be a move by Nintendo to maximize sales of the new release. As of yet, the company hasn’t commented on the issue, but hopefully we’ll have answers soon. What do you think? Is Nintendo being deceptive? Was this just a mistake? Share your thoughts in the comments below. Line up the people pretending they're upset about this as if they were going to buy it on WII U all of a sudden. @Rika_Yoshitake Nintendo apparently thought lots of people would buy the $20 Wii U version instead of the $60 Switch version or they wouldn't have taken it down. The real issue is that the all digital future will look like this. Companies delisting games with no notice and for any reason they see fit. No doubt they would have recalled all the physical copies too if they could but in an all digital future, there will be no physical option once a game is delisted. I got DKC Trop Freeze, for free, from my last Club Nintendo reward upon it's closing. It's been on sale on the WiiU eshop for $20, for years now. You can still buy a physical copy for $20 and a used copy for even less. I think pretty much everyone that wants this on WiiU has it. Not even kidding I was going to get this. I love you Nintendo and I will continue to support you with all of my heart, but I refuse to double-dip on a game that only adds an OP character as the only addition for $60 (sure, there's faster loading times and portability, but...eh), even if the game is great. I'd gladly join in at $30 or less, but any higher than that is a no-go for me. Much rather get the Selects version. @Crono1973 It's theoretical times like that that would drive someone to hack their own console for some otherwise unobtainable ROMs. Honestly, with the odd price hike on the Switch version (considering the lack of any major content), I am shocked Nintendo didn't just include a HD Donkey Kong Country Returns with Tropical Freeze. I would have double dipped in a heartbeat to have both games together and the price wouldn't have bothered me one bit. It's really odd when you consider that titles like Hyrule Warriors Definitive Edition has all DLC or Captain Toad actually adds new levels for the same price as their originals. @Prof_Yoshtonics I did the exact same Club Nintendo thing. However, I never played it until a few days ago. Sadly life got challenging around that time and I forgot about it until all the news about the Switch version. I was not a huge fan of the original SNES game, and this one feels about the same. Since I still frequently play my Wii U and it is hooked up right next to my Switch, I will most likely will just play that version and be happy. I am glad I have it downloaded. I wonder if they will do the same with Toad Treasure Tracker. I have a digital coupon for that game that I guess I should use!! @Rika_Yoshitake Personally, I'm planning on suddenly wanting to buy a lot of games from the Wii U eShop the day after it gets shut down completely. @Rika_Yoshitake line up the NDFers blindly defending Nintendo for this move. It's not about people that were or were not going to purchase the Wii U version (although the price discrepancy sure lends some credence), it's about the principle of the matter. Just the latest in shady nickel and dime tactics from the little N. Labo and its joke of a price point being the move just prior. Nintendo saw dat the Wii U version wasn't funky enough, so they had to remove it due to DAT reason. This is an extremely underhanded move from NoA if not a mistake. Sony probably paid off Nintendo to take it off the eshop. @Anti-Matter Don't tell others to just shut up like that, please. With the amount of folks who hate digital and hate the Wii U, this shouldn't be a big deal right? Sersiously, some people chose the most bizarre time(when it was dead) to all of a sudden be a Wii U supporter. For the record, you can still buy digital codes on Amazon and physical copies haven't vanished..
From a morality standpoint its outrageous to charge full price for a port of a game a few years old, but from a business standpoint easy money, I personally know a bunch of Switch owners, who skipped the Wii U who are hyped on this game and will gladly pay full price for it. I am still on the fence I loved the old DKC series on SNES but I can't put my finger on why the two new ones have felt lackluster compared to the originals. @TreonsRealm I know people on this Website are more than aware of what is going on, but I would wager that Nintendo is banking on the average Switch owner to be less than informed and/or not care that this is a port from the Wii U. But for many people it might as well be a new game. But I can hardly believe that anyone who has a Wii U and wants this game and has not already bought the game on the Wii U would opt for the Wii U version just because it is cheaper. You never even know, Nintendo may have sold a few more copies on the Wii U just from the buzz around in the Switch release. I hope it is just an oversight, but I doubt it. Nintendo is lucky they have such a dedicated fan base. It's real damn stupid they removed it, and Nintendo deserves to be called out for it. Unless people really put up a big stink over it though, no one would care and I'm gonna call it now: the game will outsell the Wii U version even despite the higher base price. So really, Nintendo is still gonna come out on top with the money. I'm thinking it's a glitch, but if not I don't think the Wii U player base would even put that much of a dent on the Switch sales. Look at MK8 Deluxe one of the best selling Switch games so far. Hey look, a good reason why physical > digital! Really, I'm not very surprised by this at all considering Nintendo wants to sell this game for full price all over again just for the added Funky Kong which is really dumb but oh well. "Hey look, a good reason why physical > digital!" i was wondering how long till this news was reported. @SheldonRandoms In case you weren't aware, it's important to inform you how utterly fantastic your profile picture is. Thank you have have a good day. Yeah that's scummy on Nintendo's part. No defending it. This kind of stuff is the reason I always buy physical if I can help it. Loved the Wiiu and still do. Time to make new games Nintendo! Cut this crap out. I don't need a portable WIIU. I already own this game. I disagree with this decision if it was in fact deliberate. However, I wanted to mention that a lot of the comments here are trying to use this as an argument that physical is better than digital, which doesn't make a whole lot of sense. I have the digital version of this game on Wii U and I am completely unaffected by this situation, just as an owner of the physical version would be. Switch-era Nintendo has been rather greedy Nintendo, so this does not surprise me. @ALinkttPresent What if you didn't own this game though and one day you wanted to. What would you do? You would go find a physical copy. Now imagine if there were no physical copies because the all digital future was already here. Guess you would be out of luck. This doesn't particularly affect me since I have the physical version nestled safely in my entertainment center, but that's a bummer if digital Wii U owners won't be able to download the game again. Business-wise (if this isn't indeed a mistake), this makes sense. Morally? E-hee-hee....Nope. Keep your grubby hands off my glorious physical collection of games, Nintendo! I have no interest in buying digital and this just furthers that notion for me. If I buy digitally because I want it on the system always (games like Mario Kart), I always seek out a used physical copy as a back up for my collection. I've done this a few times on Switch. That won't change anyone's mind about paying the insane price of $60 for rhe Switch version. You can get the WiiU version used for $10 on Amazon. You can still buy the physical version at the low price and I've heard that those who already have it can redownload, but this does seem worrying. It's probably so Nintendo can deny they were selling the game for that cheap. It's really a rip-off to charge people $60 for a game with minimal changes from the one that released 4 years ago. @ALinkttPresent This does not affect anyone who owns the game, but there are plenty of people who still play and buy digital games for their Wii U. There is also a group of people who are perfectly content with buying video game consoles a generation past. Or late comers who still want to buy digital games and have no interest in a Switch yet. I do not care. I am still getting the switch version this Friday. @Deku-Scrub I see what you did there, lol. @SwitchVogel That is true. I had to delete the game for space, so I immediately checked to see if I could redownload after reading the article, and yes, you can still redowload the game. Considering the game is still sold physically in stores and on online retailers (the Wii U version comes right up after the Switch port on Amazon), it leads me to believe that this was a bug. If people were to search for the game, they would easily find out that it is an expensive port. While it does seem rather suspicious, I do not see why Nintendo would remove the game from the eShop just to prevent those who still use the Wii U eShop from buying it considering physical copies are still prevalent. Besides that, only the NA region is affected and not any of the other regions. Plus, no other Wii U port has been removed from the eShop after its Switch port released. This further leads me to believe that this is an isolated incident. Getting mine on Switch this friday off amazon.us for about 45 bucks with prime and amazon card. Best version with funky kong and portability. Never bought it for my Wii U because there's never enough time at home to game properly. I don’t believe this was done on purpose. If it is it’s certainly a betrayal of those who were planning to get this on Wii U. It sets a really bad precedent for trusting Nintendos e-shops and willingness to support their hardware. I think it’s probably a mistake though. @ReanSchwarzer7 Why do you always have to start rumors like this? You can always redownload something even if it has been removed from a digital shop. Just no new purchases can be made. I haven't any reason to believe this is deliberate. If it were, it would be gone from all regions' eShops, not just NA, and they would've done this with the 4 other games (yes, only 4 first-party games) they've ported from Wii U to Switch. Neither of those are the case here. I want the Switch version, but not for $60. Pass. I’m happy with my digital Wii U version. Guess preorders aren’t as high as expected or they’re paranoid about the sales. Shouldn’t have made such a great game so cheap. Now you look silly and desperate, Nintendo. $40 would be a reasonable price. Maybe later on I’ll consider it... I think I’d have rather seen an all new DKC at this point, though. 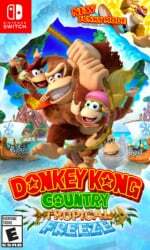 Wii had DKC:R, Wii U had DKC:TF, and Switch should have a 3rd entry. My opinion doesn’t matter though. Nobodly listens to a guy named after two failed 90’s systems. @KryptoKrunch according to the article it cannot be purchased via Amazon download code now either. Though I don’t know if they mean there’s no page to buy it from now or if the download codes have been disabled or what. Either way, hole in your argument right there. Personally, I’m not affected (already have the game) and don’t see a point of getting worked up over this, it won’t change much. But the principle is pretty bothersome, it’s practically scalping their own games, removing cheaper options do you MUST pay triple the price. So I can see why people are upset. I was personally never gonna get this to begin with, I got the Wii U version when it came out and enjoyed it and don’t want to spend $60 for the same game only they added my favorite character in as easy mode (I might’ve considered if Funky didn’t break the game because I love him but if I wanted to pay $60 for a short, easy platformer I’d get the new Kirby). I highly doubt it is an error and it isn't surprising as Nintendo of America do seem to make some pretty stupid decisions at times. It is anti consumer and reflects badly on them and I say this as someone who will be double dipping on the game. Here is another topic for you Nintendo Life: Maybe you could ask Capcom UK to explain why Street Fighter 30th Anniversary Collection is £44.99 on the eshop and therefore a tenner more expensive than the PS4, and I assume, Xbox one versions of the game. By all accounts it has price parity in America so what is the difference for us UK'ers. Maybe it is the same accross Europe but either way it is taking the mick. The joys of a digital only future. Games get delisted all the time. At least this one is available physically. @Winklebottom I love your avatar!!! FAO owners of DKC TF on Wii U. For the millionth time, this release isn't aimed at you. Do you play Nintendo games? Do you own Nintendo consoles? Are you five years old? I ask all these question because you seem to really hate Nintendo with a passion, which begs the question why are you here? And I assume you are 5 years old or similar because you say things like "NDFers" which I can't imagine anyone over 12 years old saying....cause that would just be embarrassing. I actually agree with you about it being about the principle of the matter but you just can't resist sounding like a tool whilst you do it because of all the extra crap you include in your post. Physical I would begrudingly understand, but not at a tenner more. Also the eshop price being a tenner more expensive too is a joke when in other territories, like the US, the Switch version has price parity. No in this instance it seems to be the UK is getting a price hike for no reason. I disagree about it not being aimed at Wii U owners with DKCTF. I am one and I am double dipping for proper portability and crisper visuals and better load times and funky mode! If it wasn't aimed at Wii U owners at all they wouldn't have added any extra content. However if you are still only a Wii U owner in the US and now decide to buy DKCTF on it because of this advertising for the Switch version and the option has been removed from the eshop....that is a [removed] move by NoA. Hopefully all these stories on it around the web will convince NoA to wise up and make it available again. This is wrong and there's no defending it. This wouldn’t surprise me. The recent remaster of Burnout Paradise has resulted in MS/EA disappearing the digital download of the 360 version from their store. The 360 version is backwards compatible with the Xbox One and available at only a fraction of the price of the remaster for only a small graphical downgrade so it’s no surprise it vanished. I think it is on purpose and I don't see anything wrong with it - minus those people who have bought download codes. THAT shouldn't change, essentially you already bought that version. They probably don't want people buying the Wii U version cheaper, thinking it has the new features of the Switch port. Come on, be reasonable, you KNOW someone would do that, and throw a tantrum. Absolutely true. Same applies to anyone using Xbot or Sony Pony. They could be making the best point in the world but it wouldn't matter. Nobody will take it seriously. I'm a Wii U owner as well and will buy it on Switch but we're just a bonus. They'll get double dippers because of portability and because Nintendo fans. The main target market though is those who missed out first time around. R E P L A C E D .
So what? It's not like Wii U users are going to buy anything from the eShop. Most Wii U are in the garage rusting away. I wouldn’t mind if they gave the Wii U version a price hike while the Switch version is new, but I hope removing games because they are available on newer platforms doesn’t become a thing. Can someone that owns it still download again if needed? It was being sold at about half the price of the new Switch release, so that would've looked bad. Suddenly kicking the price back up to $59 would've looked suspecious too. Removing the game from the store altogether is likely the least amount of damage they could do, even if it still is a shady move. The theory of foul play doesn't make sense since removing it from the WiiU eshop would not have made the Sales of the Switch version worse. Everyones just about done with the WiiU, so why go back and buy a 4-year-old game on an outdated system just because a Deluxe version is coming out? Even if you don't agree with the price, that doesn't mean its gonna make you buy the WiiU version instead, so really it would make little to no sense for foul play when people have had 4 years to buy the game already on a system that's been dead for over a year now. Porting games is okay, as some of my fav games get to have a bigger audience of the Switch.. But removing the option to buy it on it’s original platform altogether can only mean an evil money sceme. If it’s for clarity reasons, they could’ve just noted “No Funky Kong included” on the Wii U shop page, or something. Where’s @SLIGEACH_EIRE when we genuinely need you! @Rika_Yoshitake Yup. Pretty much. On top of that, I'm certain this is just an error. I mean why would Nintendo pull DKCTF off the Wii U eShop but not say, Mario Kart 8? Or Bayonetta 2? It'll pop back up probably. Update: See? Told you. Now put the pitchforks down people. Go get unnecessarily angry over something else. No no no, this is new Nintendo, the now greedy company that under Iwata gave all their profits away to puppy rescue charities, viciously bullying the masses of people who've had over 4 years to buy a digital copy of DKC:TF but have waited until this weekend when an improved but more expensive version appears on a better system. Big nasty bullies. How many people worldwide will this actually affect? This is a non story. People love getting angry for no reason. If people really hate ports of 4+ year old games at full price, maybe just don't buy them? Otherwise you are just giving Nintendo the greenlight to make more lazy full price ports. Hopefully people see sense and retailers will be forced to charge around Wii U version now. Howlongtobeat.com lists this game at about 11.5-20 hrs long. 30 hrs for completionists... so if it hits $20 for Switch, I’ll gladly pay for it. $60 for a 2D platformer seems too much tho. I wonder if NoA is doing this temporarily or if it’ll be permanently removed from the Wii U eShop. @YamAsereht it’s not that I don’t want Wii U ports on Switch. I just feel like the wrong games are getting ported. I’d prefer Windwaker HD, Metroid or Pikmin Trilogy. I feel conflicted that if enough people don’t buy into the ports, we may not see the ports that I want. @moe_vega I also love DKC and even Donkey Kong Land on the Gameboy. The newer games are pretty bad though. Very linear level design with almost no verticality, movement feels less precise. Donkey Kong controls like the rhino from DKC. No button for running like in Mario/DKC. Gameplay seems more trial and error(memorization) instead of exploration. @AlternateButtons Mario Kart 8 wasn't discounted on the Wii U. @Whalehome I am OK with those games getting a 2nd chance on Switch, more so Mario Kart 8 and Bayonetta, if new players are getting a chance to play those. Just not at obscene prices, with minimum new content is all. @MaseSco Ice E no problem with your comment. If you shop around you can get this game for less than its RRP. I'm in Ireland where most new release games for all consoles cost €60. I'm getting this game for €45 in my local toy store. That to me is a good price for a new game. Sure it might be cheaper on Wii U. But not if you have to buy the Wii U first. Also when I'm done I can trade the game in and probably get €10 minimum back. Maybe as high as €20. @YamAsereht you’re right about Bayonetta and Mario Kart. Though they don’t really offer much, they at least feel longer (Bayonetta being two games and Mario Kart 8 being highly replayable with friends or online). But I don’t want ports like Hyrule Warriors or DKC TF. Don't worry too much about which Wii U games are getting ported. Almost all of them will except the likes of Nintendo Land which used both screens. They're all making money, they just need to space them out a bit. Metroid Prime Trilogy was a Wii game which means SD which means a bit more work. You never know though, might make sense before 4 comes out. Remind people how good it is. 1) They will sell though. There's a big market of people who haven't played Wii U games before and a smaller market of people who will pay for the improvements and portability. 2) Retailers don't set the prices, Nintendo do. 3) Anybody expecting games on a new system to launch at the price they are on an older system is living in a magical happy land of fairies and elves. That isn't how it works. Things like this are the reasons why I always buy physical. Love the quote: 'some are saying that this could be a move by Nintendo to maximize sales of the new release' SHOCK HORROR! Nintendo is a still a company, of course they would want to maximise sales. Anyone who was going to buy it on the Wii U is most likely to have done it already so I don't really see the problem. Disgusting. This doesn't even make sense, are they just trying to cover up how cheap it was? This better be a mistake. I'm not here for anti consumer practices. I own this game on Wii U but uninstalled it for space. My guess is it will return to the Wii U eshop at some point in the future. From a business standpoint, it makes sense to remove it for a little while. Anyone making a search for the game will be led to the Switch version. And 99% of those who want to get the game this month is probably interested in the a switch version. So this avoid confusion. And if suddenly the Wii U physical version becomes scarce, then it's an added bonus. They could always makes another printing. Yes, ports should probably be cheaper, but if people will pay full price, then that's leaving money on the table by charging less. That's a pretty shady thing to do. If you haven't bought it on Wii U, you can get it pretty cheap physically, cause it's one of the Nintendo Selects. @electrolite77 It was Shuntaro Furukawa. After ascending the throne of Nintendia, he gave direct order to burn all Wii U copy of that Ape game and delete all online eshop existence. @electrolite77 of course, my bad...bad Nintendo! Fire Reggie, Furukawa should step down etc etc. Let's leave a game which looks worse, has longer loading times and a larger file size and had to be reduced originally because nobody was buying it, up on an eshop hardly anyone uses, otherwise we'll get a handful of commenters on Nintendo sites marching to Kyoto with pitchforks and flaming torches crying about anti consumerism. I think they'll live with that. What a stupid way for Nintendo to shoot themselves in the foot over the publicity of this happening. Its just a gimmick. Asking 80$CAN for this game is a shame. @mailman You can still redownload it if you own it so there’s no punishment to owning it digitally. Seems like the standard Nintendo touch. I feel like a lot of people have the wrong idea here. If you already own the Wii U version, this doesn't affect your digital copy. You can redownload it even if you deleted it. All it means is no new sales, which probably wouldn't happen anyway. I doubt many Wii U owners were waiting to buy it for the past few years and just haven't gotten around to it. A lot of us even got it for free when Club Nintendo shut down. Feels like a non-issue to me. This move leaves a really bad taste in my mouth. I already played through the Wii U version and was going to pick up the Switch version next month since I enjoyed it, but I'm in no hurry to play through the game again. I suppose I can wait until it's heavily discounted or available used. I don't want to reward Nintendo for horrendously shady business practices. I’m sorry, but not letting people redownload the game if they already own it is probably one of the most anti-consumer actions I’ve ever seen a game company perform. On other platforms, removal from a storefront doesn’t destroy the ability to download, even on 3DS (I accidentally deleted the GB Tetris once but could get it back even though they removed it from the store), so there are zero excuses for this. You can still redownload the game if you've previously purchased it digitally. @SBandy hey man, NDFers are a real thing. As for being offended or upset by it? What's the saying? If the shoe fits? Anyways. There is absolutely a subset of the Nintendo base that will blindly defend any and all Nintendo actions, motives and/or decisions. That's absurd. There's absolutely no reason for that other than just plain denying people the cheaper option. I already own the game so this really doesn't affect me at all but there is no possible way to spin this as anything but scummy. If the shoe fits who exactly? Clearly you are over 12 years old so I guess you are just that sad. As I said it is embarrassing. Get a life. So, it's back on the eShop. Well its back up, maybe a bug fix or something else? Anyways, had this been permanent from a business standpoint I could have seen the point as the number of people who would still buy it are probably in the three figure range. But doing it without warning would have been a bit of a d*** move. But its back, the “outrage” is over, nothing to see here, go back to your Switch’s, Wii U’s, SNES’, Game & Watch, Love Testers, etc. Nintendo got free press and now both games are on the radar. Now people will buy the game on the Wii U because they see that Nintendo can take it away any time they want. Now everyone can relax again. Clearly Nintendo read your comments, realized the error of their ways and now wants to pretend that they never tried this shady underhanded tactic to boost sales. Seriously though, think through this whole scenario. How would this have helped boost sales? When they released Mario Kart 8 for Wii U, cutting off the online play for Mario Kart Wii made sense because they were trying to convince those people still playing it on Wii that they should move over to the new system and game. Taking DKTF off the WiiU eShop would not push anyone (at least not a significant amount) to buy it on the Switch. @jimi I don’t know about you, but I have never been under the impression that digital games would remain downloadable for more than a decade. I don’t have a trust issue because of that at all. I do wish they would guarantee the long term availability, but they don’t. It is a long term rental, and anyone is free to not use it. Now it seems the disappearance is over, as expected. Nintendo prefers people to buy physical. I prefer to buy physical. That their terms are not good enough for you is one thing. But it isn’t a broken implicit promise at all it seems to me. Ok, now that I have read the whole article: Nintendo, you are a bunch of a..holes!! @gatorboi352 NDFers aren't a real thing. The xeal of the newly converted is, and constantly seeing it here is tiresome. It's a shame, too, because once upon a time, when you weren't seeing bogeymen everywhere, you actually said things worth saying. Why can't you just accept that it's okay to like Nintendo? It's fine that you don't, but it was also fine when you did. So I guess some people overreacted as per usual? It would make no sense to pull it for good, they didn't do it with any Wii U port so why would they do it now? Wii U digital games will be pulled when the entire store goes down, which is still far away. Am I the only one who's noticed its not back on the eshop? It's still not back up. The people who said it was were wrong. In fact, it's also gone from Nintendo's website as well. "hey man, NDFers are a real thing. As for being offended or upset by it? What's the saying? If the shoe fits?" Still missing the point. Use NDF, or Xbot, or Pony and you will-rightly-get mocked for childishness. "Anyways. There is absolutely a subset of the Nintendo base that will blindly defend any and all Nintendo actions, motives and/or decisions." Yeah. It's impossible to take anybody seriously who takes a relentlessly one sided perspective on a subject. Positive or negative. I figured that they would put it back. Nintendo doesn't care that its cheaper on the wiiu...if you only have a switch where you gonna buy the game? And vice versa. The folks that own both are too small in number to make an impact. And many of us are willing to double dip. What are you talking about? It's right here - Though I only see a spot to physically purchase it and not digitally. The drama some of you live to stir up. Truly, some of you need a job, GF/BF, things to do...all this drama over a game most of you never played and have no intention of playing? Get out and do something with your lives. Truly a ridiculous comment section. I guess it was an error and they've corrected it, or simply responded to the negative reaction. Either way it's back up and anyone who WAS thinking about getting it, on Wii U or Switch, do it. A masterpiece, one of very few Wii U games I pre-ordered. Buy it and love it! @electrolite77 Oh, that softens this whole thing a little, then. Thank you for the information. Darn it! I knew I should have spewed my fake outrage this morning when I had the chance! @BigKing .....I never said it was? Reread my comment. I mentioned nothing about price. @bimmy-lee No worries, they're going off a bit in the DKCTF review page, great stuff. @electrolite77 He borrowed his brother's Switch for a few weeks so he now has a valid opinion. Don't care. Getting the retail anyway. Who would ever buy the WiiU version for 20 bucks even though it looks nearly identical to the Switch version. WiiU doesn't have an easy mode! @cfgk24 I can't believe people are going ape. I couldn't give a monkeys. @MaseSco Yeah, are these people fur real? @cfgk24 They have a good reason to be mad though. The five people who were even planning to buy the Wii U version, rejoice! @jimi "Those companies should be sued for this. It shouldn't be legal. If they are unable (actually unwilling) to support their digital stores, then they simply should not be allowed to "sell" games digitally." You're kidding, right? Sony and Nintendo won't (read: can't) keep their old digital servers up forever so they are stealing from consumers? You realize it costs money to keep servers running and at some point the cost to benefit ratio of keeping a store open that nobody is buying from becomes too great? Get a clue. Now, taking a game down from your store, that you own the license to and have no reason to take down other than a newer, shinier (and more expensive) version is releasing elsewhere is crap. There are other reasons to take games off your store that aren't crap, like losing the license to it (Nintendo used to have C64 games on the Wii Virtual Console for instance but they don't anymore), those are reasons beyond your control. But taking a game down just because you want to make more money elsewhere, well, now you're just being a ****head. Tl;dr: Nintendo closing the Wii Shop is reasonable, Nintendo taking down DKC:TF from the Wii U eShop is not. @Madmortagan68 These are exactly my thoughts. Amazing game, but it doesn’t worth $60, not even back in the original launch. @Dang69 Completely playable (and more enjoyable) without the easy mode. Same for Returns. Challenge is the key of fun in DKC games, otherwise they’d simply be Mario clones. @rushiosan lol I was being sarcastic about this being 60 bucks and basically the same as the WiiU version, which you can get for dirt cheap. No way would I play this on easy mode - whole point of platformers are the challenge. @Dang69 Oh, I see, sorry for misunderstanding your point then. It is still gone @SwitchVogel I just checked. It still appears to be a thing for the Europe eShop. This actually convinced me to purchase a used copy at Gamestop. So I am guessing all them people going crazy on the net about this are now gonna buy the Wii U version. Would have been nice if it had been taken down for an update to retroactively fit the Funky mode to the WiiU version... I might stand a chance of trying it again. I hope it's just a mistake and that the game returns to the eshop of the wii u it would be much better for nintendo otherwise it would not be good of them, even if the game we may still have it in version physical.